Looking for the perfect Mother's Day Quotes for Mom this year? You'll love these sweet, sentimental, funny, and caring quotes and ideas for your Mother's Day gifts and cards. Mother's Day is a great celebration to remember how our moms have given so much of themselves in taking care of us. If you want some DIY craft ideas to show how much you care, why not add some Mother's Day quotes in case you just can't find the words to say. It can help you express yourself even more. Be sure to scroll all the way down and check out the Quote Generator! If you think about it, this quote by Sir Edwin Arnold is so true! Your mom will always be there for you no matter what. Mother's love is the closest thing to the compassion love of God. See the full quote here! “A mother is clothed with strength and dignity, laughs without fear of the future. When she speaks her words are wise and she gives instructions with kindness.” This Jewish proverb on a card is the perfect Mother’s Day gift for any mom. “Successful mothers are not the ones that have never struggled. They are the ones that never give up, despite the struggles.” – Sharon Jaynes. Inspirational quotes like these are great for your mom and grandmother. Need something you can print in a cinch? Download and Print one of these GORGEOUS options from our friends at Personalcreations.com. Click here to download these wonderful Mother's Day Cards via Personal Creations. These will make the sweetest sounds for your mother: “To the world you are a Mother, but to your family you are the World.” Your mom surely know how much you appreciate her and motherhood! Happy Mother's Day quotes can be as simple as this: “Good moms have sticky floors, messy kitchens, laundry piles, and happy kids.” It's short, simple, and silly, and she’ll definitely love it! “A mother is she who can take the place of all others but whose place no one else can take,” by Anna, Siolhan & Jack. Despite having salaried jobs and housework, your mother will always take care of you. A tall order of characteristics every mom should have: “Amazing, loving, strong, happy, selfless, graceful.” This Mother’s Day quote is a clever acrostic of the word mother and your mom will surely appreciate it! “My mother, she is beautiful, softened at the edges, and tempered with a spine of steel. I want to grow old and be like her.” – Jodi Picoult. Mother’s Day poems are sweet and every line speaks of pure love. This is what the role of a mother is through the years. She stays beside you from childhood to adulthood. Your mother is your role model, guardian, and friend, and she’s celebrated every big step you’ve taken. Like UPCYCLING Crafts? Make MOM A Diy Mouse Pad For Mother's Day! “All that I am or ever hope to be, I owe to my angel mother.” – Abraham Lincoln. Past president Abraham Lincoln shows how a man loves his mother even when he’s all grown up and leading a country! “There will be so many times you feel like you've failed, but in the eyes, heart and mind of your child you are Super Mom.” – Stephanie Precourt. This quote is the perfect way of saying happy first Mother’s Day to first-time moms. 13. Life Comes with a Mom! “Life doesn't come with a manual, it comes with a mother!” If you feel like you’re in a deep abyss or had a sudden fall from grace, you can always turn to your mom. Your mother is the best guide you have when you’re lost. “There is no perfect way to be a good mother. Each situation is unique. Each mother has different challengers, different skills and abilities and certainly different children. What matters is that a mother loves her children deeply.” – Elder M. Russel Ballard. Here's an adorable printable you can frame and give: “I love the little things you do.” It’s a short and simple message which will guarantee a loving Sunday (or any day). See it here. “A worried mother does better research than the FBI.” This funny quote is humorous because it's true! Instead of starting your card with “Dear Mother,” give her this humorous quote to make her smile! Let your Mom know how much you appreciate her strength this Mother's Day: “A strong woman stands up for herself. A stronger woman stands up for everyone else.” This quote is also perfect for International Women’s Day. “From the bottom of my heart… to the tips of my toes I love you!” You can make this with your baby brother or sister for your mom’s special day. This is so sweet, your dad may just ask for one on Father’s Day too! A lot of mothers will agree that, “Being a mom isn’t an easy job, but it’s definitely the best job anyone could ever ask for.” You may not know it but every mom is happy to end the day only when their kids sleep soundly. This poem by Joanna Fuchs says everything you want to express to your mom every Mother's Day! 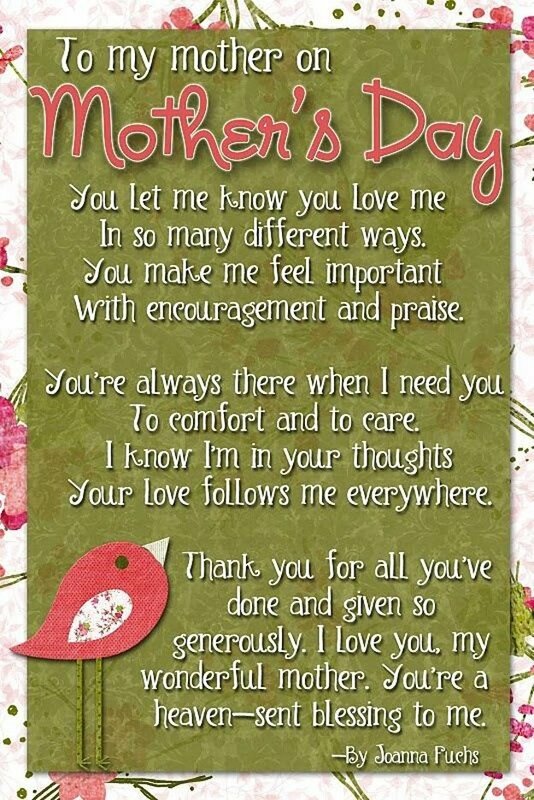 From your mother's encouraging praises, comfort and care, all the way to her generosity, this poem says it all! This is so true in almost every household: “Nothing is lost until your mother can’t find it.” Ever wondered how your mother always knows where everything is? It’s one of the biggest mysteries which make moms the greatest! Your mother and father will definitely have a good laugh with this quote: “Moms! They’re like dads, only smarter!” You can also go the extra mile by placing a photo of your mother in the center. Tell your Mom how wonderful she is this Mother's Day with this inspirational quote: “By being yourself, you put something wonderful in the world that was not there before.” – Edwin Elliot. It’ll definitely win you hearts! This is the perfect quote for a homemade Mother's Day card for those with siblings! “I love how we don't have to say out loud that I'm your favorite child.” Your siblings will definitely lose to this one! Let your mom know you’ll always be there for her this Mother's Day with this quote: “A daughter is someone you laugh with, dream with, and love with all your heart.” Print this on any picture you have together! “Moms are the people who know us the best and love us the most.” It makes sense that she loves you the most since she knows you the best! Plus! Mothers will always love their children even at their worst. Thanking our mothers for what they've done for us may not feel like enough for some. So instead of spending hours thinking about what to say, why not seek some help from tried and tested quotes? Mother's Day quotes are perfect to include in your DIY craft projects for Mother's Day. Whether you're making a DIY Mother's Day card or just want to add a happy Mother's Day quote to the DIY gift you're giving mother, you'll find something you can relate to here. Which mother’s day quotes did you love the most? Tell us in the comments below! Do you have any other craft projects you’d like to share? Share it with us and we’ll give it a try. Stay connected with us on Facebook, Twitter, Pinterest, and Instagram! Editor's Note – This post was originally published on May 2, 2016 and has been updated for quality and relevancy. Yeah…that’s not even close to what Ezekiel 16:4 is.